This post originally appeared in Global Forest Watch. For me, few landscapes can rival the beauty of the tallgrass prairie and oak savannas of the Upper Midwest. 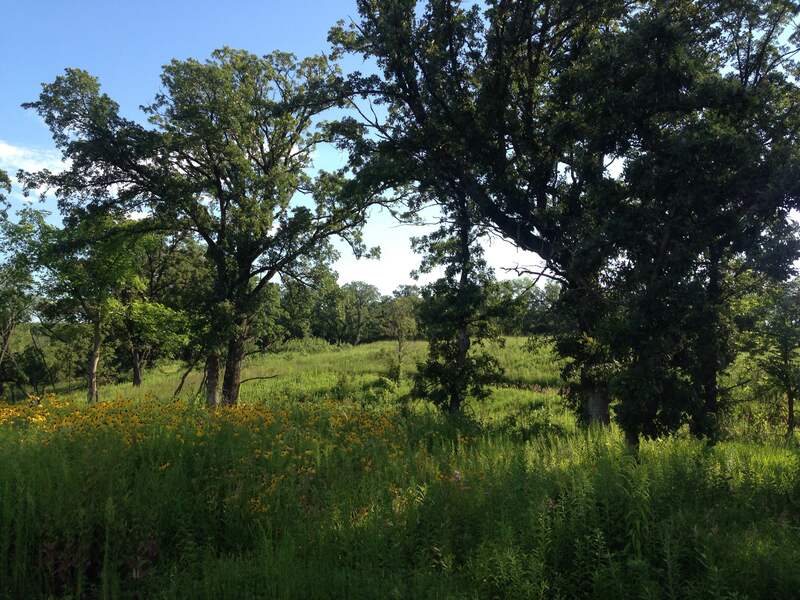 During the summer and fall, waving sheets of big bluestem prairie grass blanket the rolling hills, dotted with tall, yellow-flowered tall compass plants, bushy wild indigo and shady stands of wild burr oaks. I visited that landscape recently on a trip to my hometown of Northfield, Minnesota. There, Carleton College operates the 880 acre (360 hectare) Cowling Arboretum, a giant outdoor laboratory for conservation and restoration ecology. I set out on a jog to take the recently launched Global Forest Watch mobile site for a spin. For the uninitiated, Global Forest Watch is an online platform for monitoring forest change using new technology, led by the World Resources Institute and about 70 other partner organizations. The arboretum is easily recognizable on the GFW map as a block of tree cover, relatively dense and extensive compared to the surrounding farmland. Much of southern Minnesota must have once looked like this before the oak savannas and tallgrass prairie were plowed over for farmland. Now less than 1 percent of Minnesota’s original tallgrass prairie remains. Much of the arboretum itself exists on former agricultural land, but has been replanted with native species or allowed to regenerate with the guidance of students and staff. For that reason, I was surprised to see several sizable patches of tree cover loss in the arboretum on the GFW map. Satellite-based data from the University of Maryland and Google register more than 7.5 hectares (18.5 acres) of clearing in two areas in 2013. How could it be that trees were being felled in this sensitive conservation and restoration area? As it turns out, trees were indeed cleared in the arboretum in 2013, but as part of a long-running project by the arboretum staff and students to restore native habitats. The tree cover loss data represent removal of pine plantations (originally established as timber crops in the 1940s and ‘50s.) Although native to Minnesota, these pines are not part of the natural ecosystem in this area, and do not reproduce well on their own, do not support native species, and are less resilient to the historical local fire regime. The satellite data may also be detecting the systematic removal of invasive species such as European buckthorn, bush honeysuckle, Siberian elm, and more. Students and volunteers remove many of these by hand and treat the roots with herbicide, or clear the areas with prescribed fires mimicking the natural regime. But it’s not all about stopping the bad, it’s also about promoting the good. In addition to removing non-native and invasive species, the arboretum team are extensively planting Bur, White, and Red Oak, Black Cherry, Butternut, Wild Plum, and Silver Maple. Seedlings, which are subject to predation from mammals such as voles and overpopulated white-tailed deer, are protected by plastic guards, and others are fenced in as part of animal exclosure experiments. (By the way, this project is a great example the sort of restoration WRI seeks to scale up around the world.) Much of the replanting has happened recently, so with the exception of a few pixels it doesn’t yet show up in the University of Maryland/Google tree cover gain data yet (which only detects plants five meters in height or more, and only currently counts regrowth from 2001-2012). But as the trees grow and regrowth monitoring improves, we could see a very different map of this area on GFW in a few years. Now I have another reason to enjoy visiting the prairies and savannas of my local arboretum. Not only is it a great spot to enjoy the outdoors, but it is a perfect illustration of how on-the-ground knowledge can complement remote sensing technologies to tell a powerful story about a landscape. Because I thought this success story was important to share, I uploaded it as a GFW User Story so that future visitors to the arboretum or GFW map could understand the data better. I encourage you to do the same. What story will you tell?